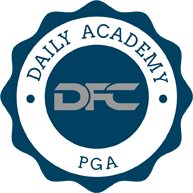 In the first installment of The Daily Fantasy Cafe Golf Academy, we're going to look at how PGA scoring on DraftKings works, and how certain stats correlate to scoring fantasy points. There are so many different stats at our disposal, and understanding how to apply them to DFS scoring is imperative at having success. Below is the breakdown for fantasy golf scoring on DraftKings. There are also bonus points rewarded for things like bogey free rounds and birdie streaks, and those will be covered later in this article. When I'm doing my daily research, I often focus on scoring stats to help build my lineups, based on the particular stats identified for each course. All scoring stats can be found easily on www.pgatour.com, and are updated weekly. On all par 72 courses, that means there are four different par 5's for players to attack. A key stat I will always look at here, is Par 5 Scoring. Generating at least a birdie on a par 5 is massive, and the occasional eagle can turn good lineups into great ones. A nifty stat that incorporates all of this is 'birdie or better %." This stat counts how often you make a birdie or eagle, and not surprisingly, the best players in the world are littered at the top of this list. Anything over 48 percent birdie or better on Par 5's is excellent, and would have you in the top 30 on the PGA Tour. Below is an example to illustrate the importance of making birdies and eagles. So, both of these players shot identical rounds, and if you were just scoreboard watching, you would think both rounds were created equal. For fantasy purposes, these rounds couldn't have been any different. Player A might have had a calmer round with less noise, plodding along tapping in pars and avoiding danger. For the weekend hacker like myself, I'm pretty happy with that (bogey tap ins, that is), but in DFS you want the Player B type. Player B took some chances along the way, and probably hit a lot more putts as well. Bogeys or worse are obviously bad occurrences for any golfer you select, but they aren't punished nearly as heavily as birdies or better are rewarded. That's the simple way to explain it, but diving deeper into the stats will Generally, the longer hitters on tour will make more eagles, so driving stats like driving distance and total driving are great for reference as well. Finally, if you want to dig really deep to find an edge, the efficiency stats are a great way to look at scoring on certain types of holes. These efficiency stats break down each par 3, 4, and 5 scoring by the yardage of the hole. If you are researching for a tournament and notice the course being played has four par 3's measuring between 160-195 yards, there is actually two stats that may help you find that edge. 'Par 3 Efficiency 150-175 yards,' and 'Par 3 Efficiency 175-200 yards,' are two stats kept that may help you narrow down your potential list of targets, or find that sleeper pick nobody else will roster. Finally, we take a look at the bonus points scoring on Draftkings, which is below. The scoring stats correlate here as well, as these small bonuses usually make the difference in winning a tournament, or just missing out on the big paydays. From time to time you will see a golfer have four rounds in the 60's, but it will only happen on the easier courses on tour. I won't try and pretend there is an analytical way to predict a hole in one, because that would be stupid. If you roster a player that gets a hole in one, be very happy and grateful. These streaks and bonuses aren't very predictive as a whole, but you'll find you get a lot more of them with the more time and effort you put into your research. Victiv may not have million dollar guaranteed prize pools, but for the DFS golf purist, they offer a unique and logical scoring system. Victiv figured out a scoring system that is completely performance based, meaning there are no bonus points for specific places, bogey free rounds, birdie streaks and all four rounds under 70, which has become a staple within the DraftKings scoring system. Listed below are the specific scoring metrics that you will find on Victiv. There was a lot of time put into building a scoring system that properly dictates how a specific round was played in relation to the rest of the field, which is exactly what Victiv's came up with. Within their contests, any players who finish with the same score, will end up with the same fantasy points. This is not true of DraftKings system, and it makes sense when you look at the size of each operator. DraftKings is hosting huge contests each week, where it is not uncommon to see 170,000 teams in the field. If they were to switch to a system like Victiv, you would see a multitude of ties, which in turn would diminish much of the top prizes. The bonus points also provide drama to the tournament, giving players a way to make up points without having to jump up on the leaderboard. That is why you often see players in 15th place outscore those who are one or two shots ahead of them at the end of the tournament. Due to the smaller tournaments that Victiv runs, ties are not much of a concern. 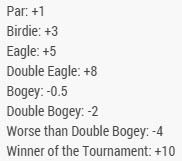 DraftKings scoring system offers a 6:1 birdie to bogey ratio, while Victiv offers a 5:1 birdie to bogey ratio. When you take out the bonus points from the scoring system, you are left with only thing to sweat, where you golfers are in relation to the leaderboard. It is a completely different user-experience, but one that is very well thought out and user-friendly. It also allows the more advanced player to mitigate variance—as there are no arbitrary bonuses that are out of your control—and focus on the most dependent aspect of their research, specifically gauging where a player will finish in relation to the field. The strategy deepens in what I consider to be the most unique aspect of Victiv's system. Instead of just picking six golfers on your team, Victiv allows you to pick seven golfers, but only the FIVE highest scoring players will count towards your total points. Below is an excerpt from Victiv's website, explaining how the rosters work. If you compare roster construction strategies between the two sites, there is one fundamental difference. The DraftKings scoring system dictates that you must not only consider where a player is going to finish, but more importantly how they got to that point. There are is a massive amount of data points that I have to consider when setting my DraftKings lineup. For Victiv, I am looking specifically at cuts made, top 10's, top 5's and wins. The extra two players on your roster only heighten the strategic elements, forcing players to measure risk vs reward scenarios for each player chosen. The scoring system might not be as flashy as DraftKings, but after having played at Victiv, I am very impressed with how they figured out the most logical approach to DFS golf scoring. As with Victiv, FantasyAces tailored their scoring system in a way that made it very easy to follow and sweat tournaments without having to calculate bonuses, or what is referred to as a performance based scoring system. They did find somewhat of a middle ground between Victiv and DraftKings, in that they do reward the winner of the tournament with a small bonus. I have detailed all the scoring scenarios below. Understanding how scoring systems affect roster building is the most important aspect to consider when deciding what site you want to play on. The second thing to consider is how the scoring system matches up with your strengths as a DFS player. If you are someone who is better at picking the final standings of a golf tournament, as opposed to how the players got to that point, then Victiv might be the best option for you. If you understand what scores are likely to make up players scorecards, and are able to weigh them against each scoring system, then DraftKings is likely your best option. However, if you excel at both, or you just prefer the middle ground between DraftKings and Victiv, then FantasyAces should be your first choice. In the cases above, you can see that DraftKings rewards under par scoring at a far greater ratio than either Victiv or Aces. Victiv molded their scoring to reflect the leaderboard in golf tournaments, meaning the player in 1st place will have the most points, no hypotheticals, and that continues on down the leaderboard. FantasyAces has the most well rounded scoring system, reflecting the leaderboard, but also adding the elements that make DFS so much fun, which is the uncertainty behind what could happen at any given moment. We all want to have a rooting interest in the games we watch, but it goes a step further than that. We want to watch the games knowing that at any moment something exciting could happen that tilts the wheel in favor our DFS teams. While I think Victiv did an incredible job constructing their scoring system, Aces improved upon it slightly by adding in the first place bonus of (+10 points). However, that only made a difference because FantasyAces also includes a version of games called “SalaryPro". SalaryPro allows users to increase/decrease their starting points by either going above or below the salary cap. Listed below are the bonus points, as well as the rewards and penalties for going above/below the salary cap. This unique game play option is the most strategic variation of the current DFS golf games available. It requires you to simulate scoring results, and then weigh those simulations against the points you would either gain or lose depending on whether you chose to go above or below the salary cap. If I had to pick one game variation to play for the rest of my life, I would most likely choose FantasyAces SalaryPro. I am a certified golf geek, so for me, I am looking for the mental stimulation that accompanies advanced strategies. With that said, this option is not for everyone which is why Aces offers both variations each week. Regardless of your preference, you have to applaud FantasyAces for finding the correct balance point of ease of use, excitement and advanced strategy.